Here’s how to make a simple canvas sunshade that is pretty easy to set up and take down. The benefit of this particular sunshade is that it has a sloped back wall, providing protection against sun, wind, and rain. It even gives you a bit of privacy, useful for when you just want to shut out the sight that modern road behind you. You can add on optional wings for more privacy, and if you do, you can drop the front and effectively close up the space. 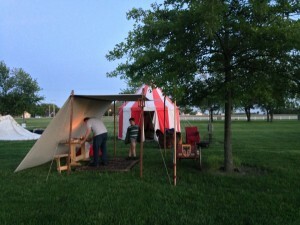 * Note on the canvas: If you only need sun protection, not rain protection, any outdoor-rated canvas will do. If you want your dayshade to keep the water off your head and belongings, however, you’ll need a heavy duty, water repellent 100% cotton canvas, such as 10 oz. Sunforger canvas. 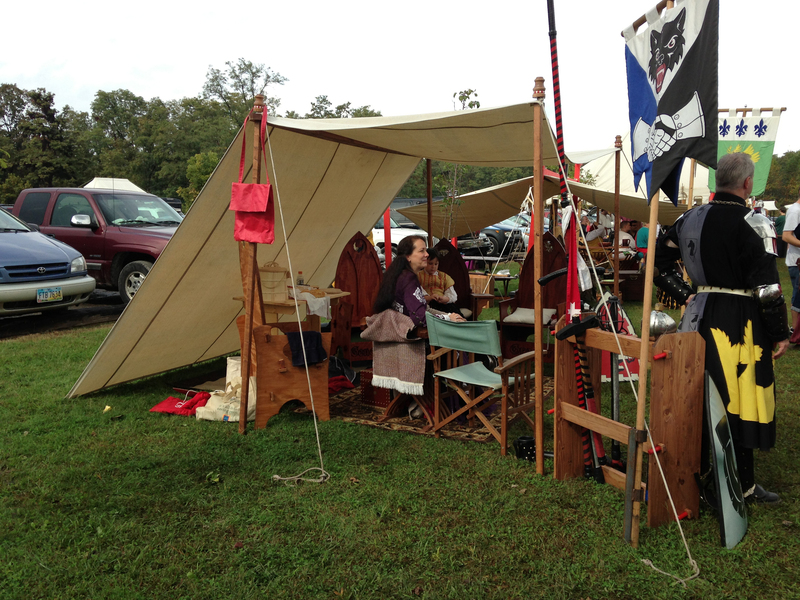 We do not recommend you use the canvas drop cloths from a hardware store unless you don’t mind getting wet! 1. 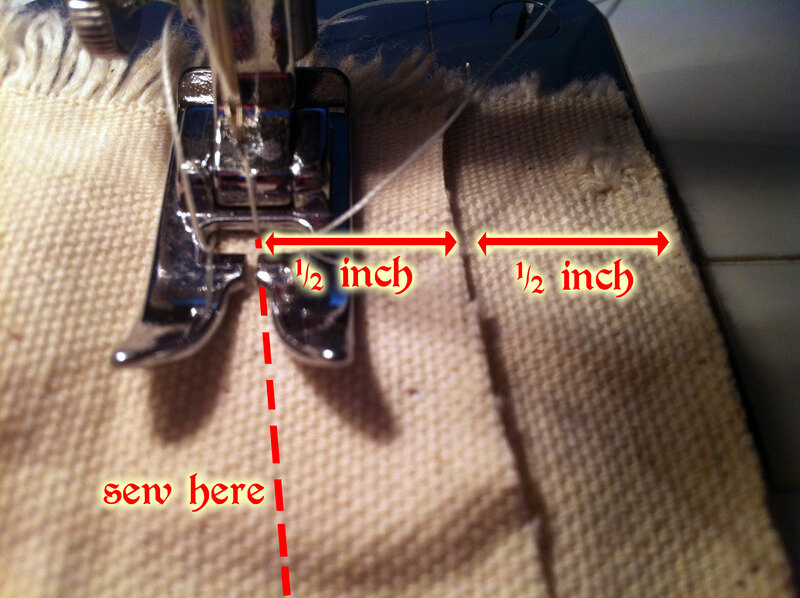 Cut your canvas as show in the pattern above. 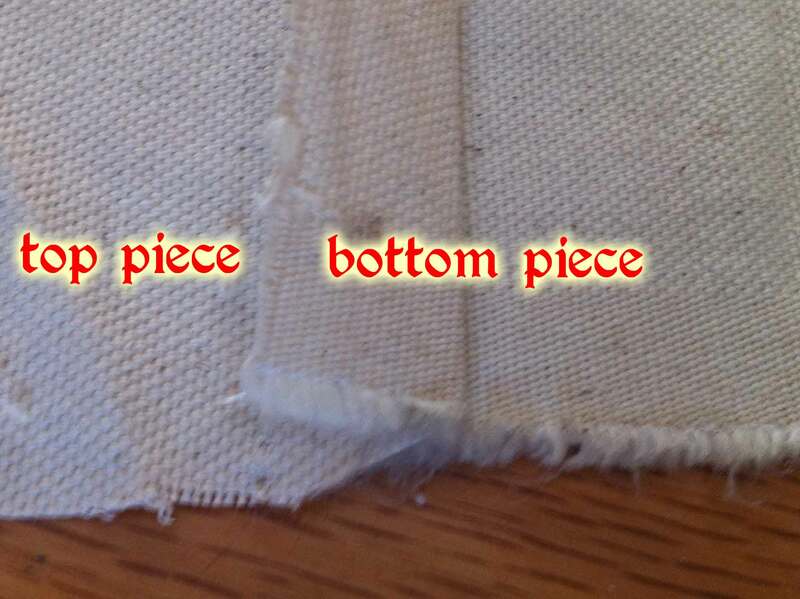 You’ll likely need to join several pieces of canvas to get a 120″ width (use my tutorial on a felled seam to attach the lengths together). 2. 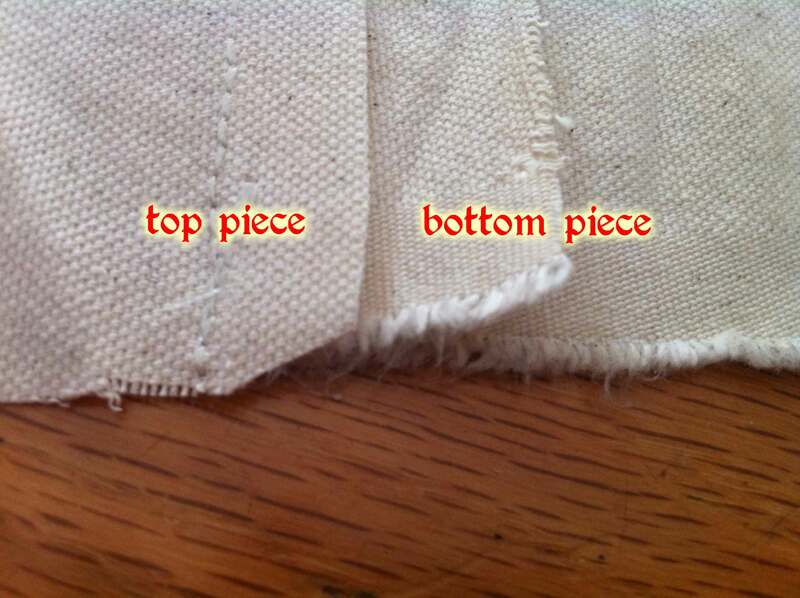 Hem all four sides of the main dayshade. 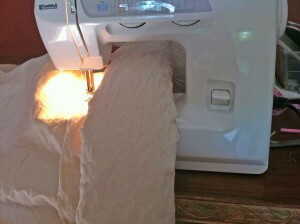 We folded over the edge twice — a simple rolled hem — and stitched it on our sewing machine. Note that not all sewing machines can handle really heavy-duty canvas, so test yours out first. I used my ’90s era Kenmore sewing machine and went slowly. 3. 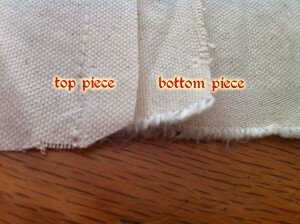 Add grommets in each of the four corners, plus an extra one centered on the back edge. 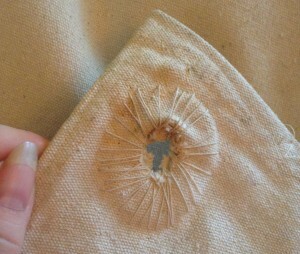 We do not recommend the brass grommets you can buy at the craft store — they will likely rip out (been there, done that). Instead, take the time to hand-sew your grommets. 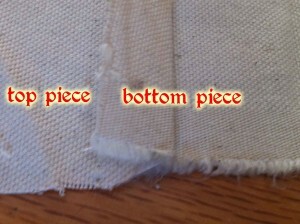 Use these directions, and sandwich in the metal ring between the canvas for extra reinforcement. Here’s what our grommets look like after plenty of use. Not pretty, but works great. 4. Cut your four poles to 81″ long and screw in a bolt to each end, making sure about 2″ of the bolt is sticking up. 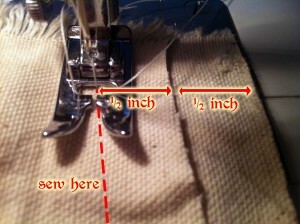 Make sure the bolt is small enough to easily go into your grommets made in step 3. 5. 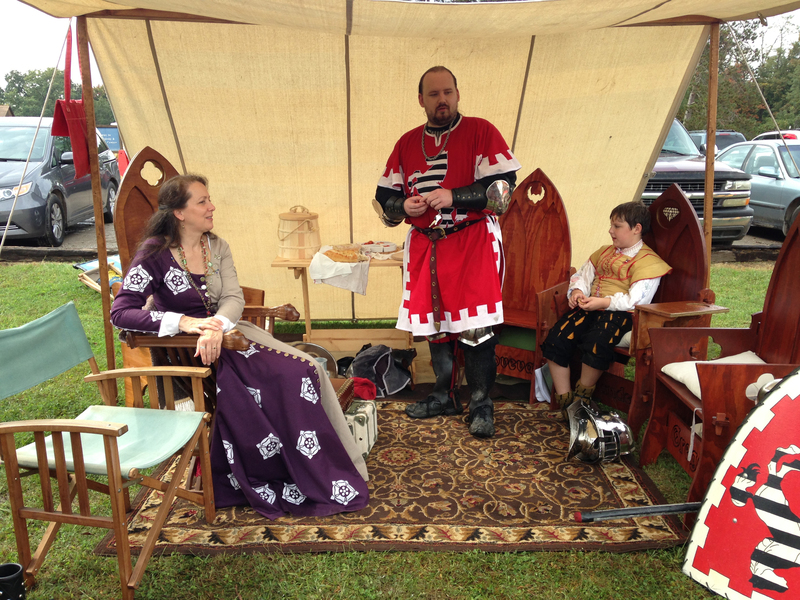 Cut your ridge pole to size (132″ long) and drill 1/2″ diameter holes roughly 6″ in on either side. 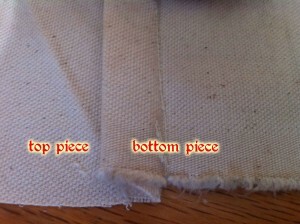 Make sure your holes are large enough to allow the bolts inserted in step 4 to pass through. 6. If you want the optional privacy wings (we have not added ours yet), attach the longest side to the sides of the back sides of the day shade (use a flat fell seam again) and add grommets to the outer corners so you can stake them down or tie them to your poles. 1. Lay the dayshade on the ground, positioning the back edge where you want it to be. 2. Stake the back edge of the dayshade to the ground using the 12″ nails (or real iron tent stakes, if you have them). 3. 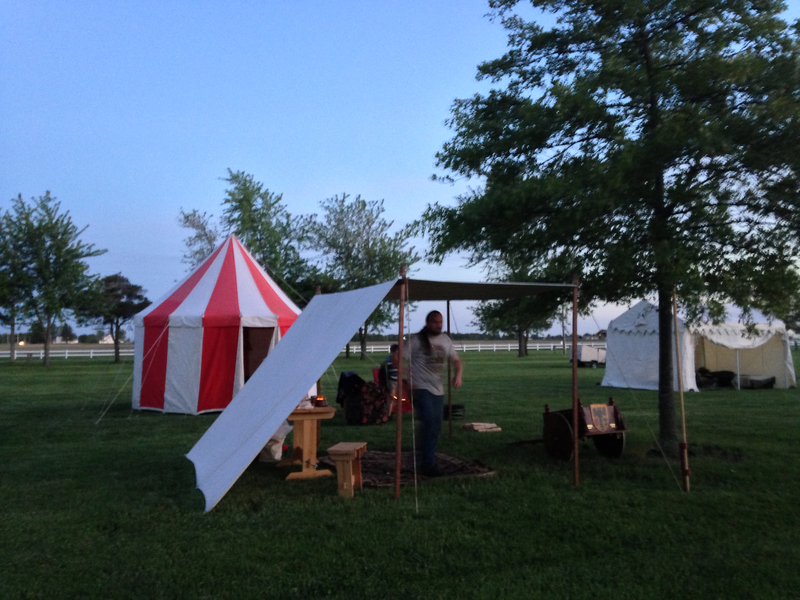 Fold the front edge of the dayshade back, put the ridge pole on the ground in about the spot you want it, then fold the dayshade back over the ridge pole (it’s all still flat on the ground at this point). 4. Position the four poles on the ground around the corners of the dayshade. 6. Insert the two front poles, attach the rope, and stake them down. 7. 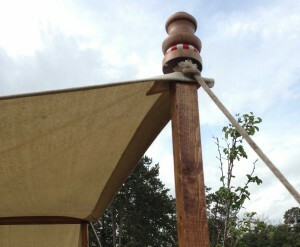 If you made finials, just put them over the top of your bolts in your poles (they stay on by gravity). 8. 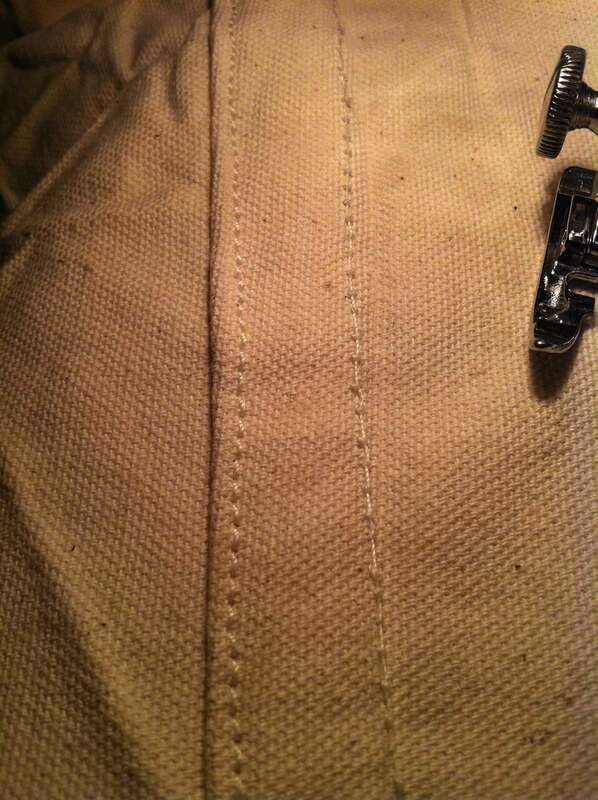 If you attached privacy wings, either tie the sides to the poles or stake the edges down through the grommets you added to each corner. 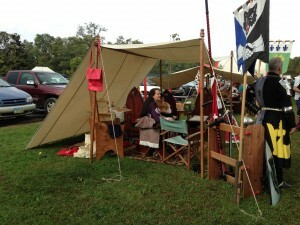 We use this sunshade at day-trip events — it sets up in about 10-15 minutes, and comes down in less time. We still plan to attach the wings, but as we have not yet, be aware that our pattern may not be perfect — we haven’t yet tested the wings. 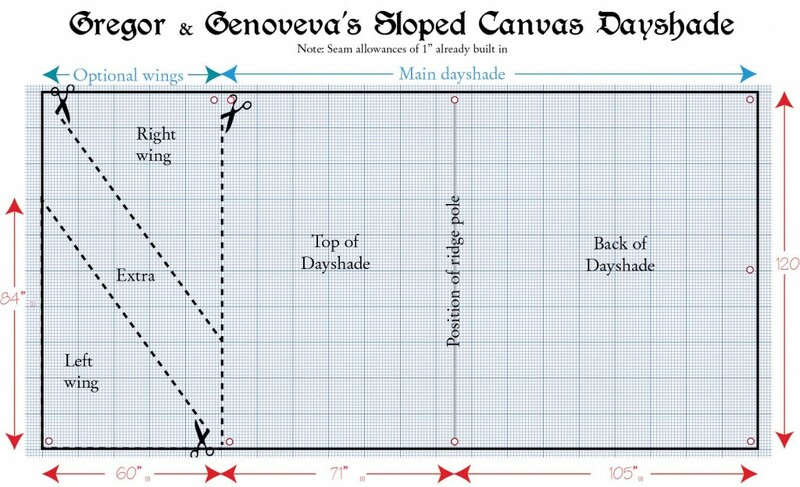 Looking at the angle of the dayshade when it is set up, it looks a bit more angled than we allowed for in our pattern. Yet that angle in the pattern should be correct, based on our calculations of the length of the top and back. So keep this in mind and your mileage may vary! 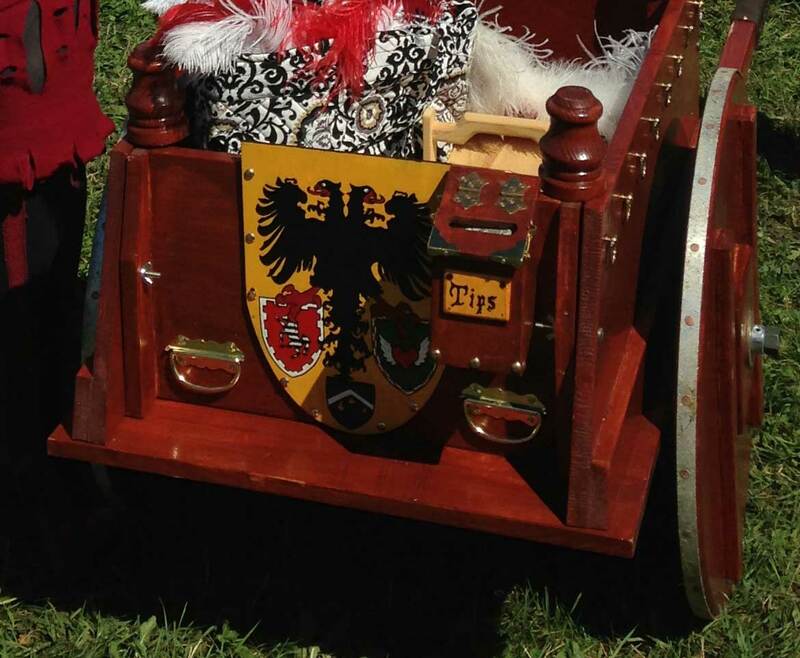 This is the heraldic shield on the back of Gregor’s cart and it incorporates the personal heraldry of our family, plus the German double-headed eagle. We shall see if we manage to do that! 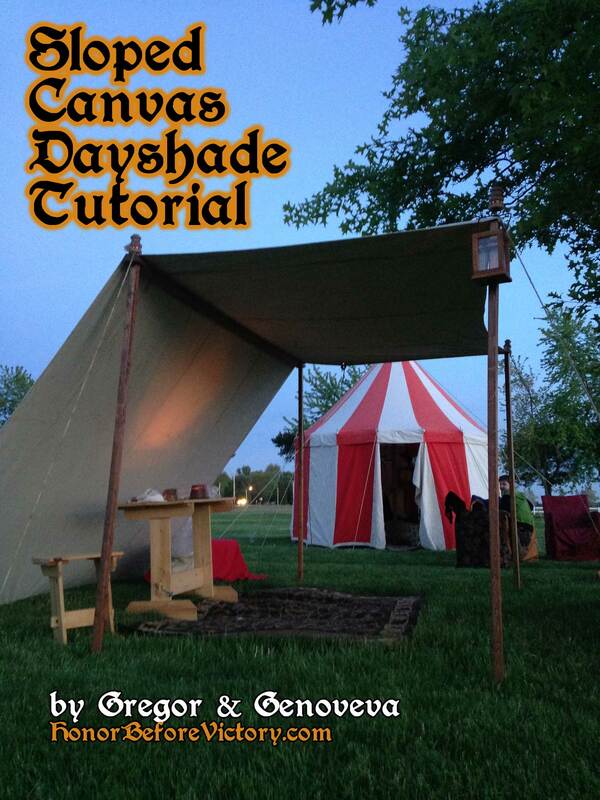 If you have questions about the dayshade, please post here and we’ll do our best to help! 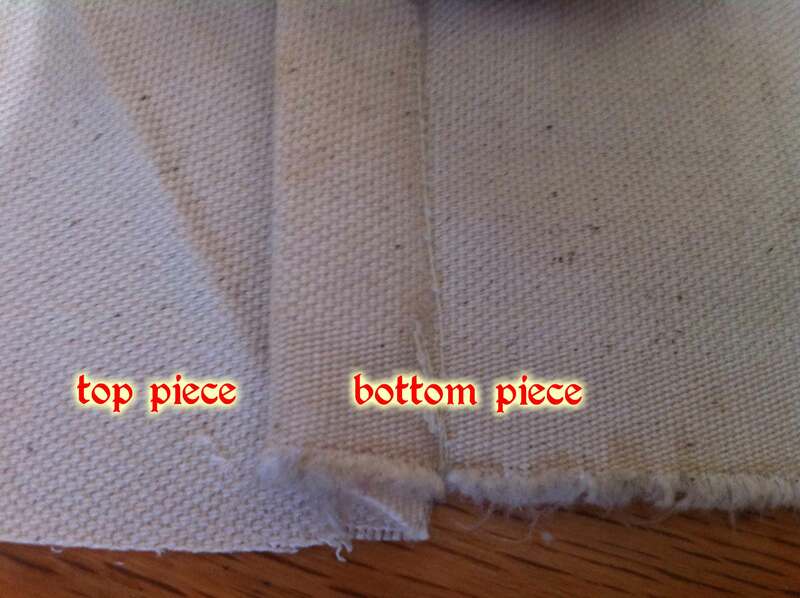 Lay two pieces of fabric together, with the bottom extending out by 1/2" inch, and sew a line of stitching 1" in from the edge. 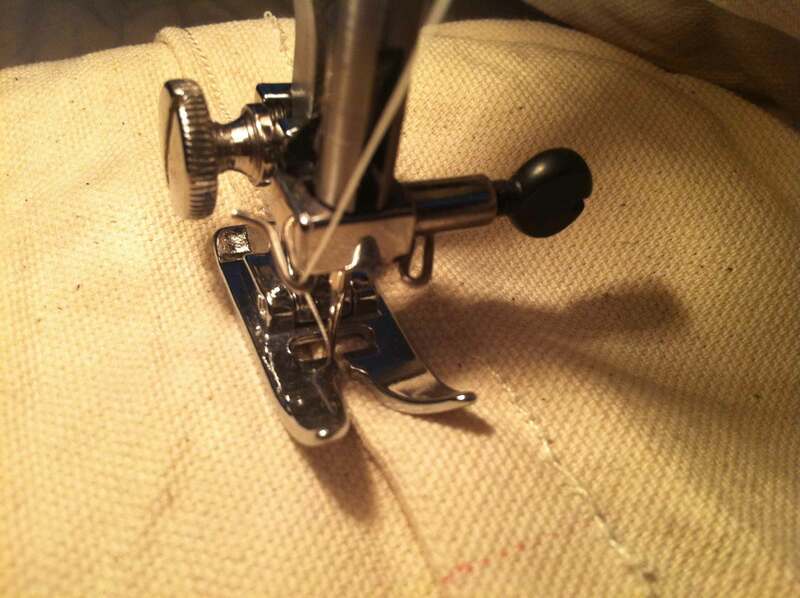 By the way, I used a size 18 needle and extra-strength thread, and adjusted the tension on my sewing machine a bit, and it worked like a charm. No broken needles!